DAKAR (Reuters) - Liberia announced on Wednesday the quarantine of a number of communities and the closure of schools across the country, the toughest measures yet imposed by a West African government in a bid to halt the worst Ebola outbreak on record. As of July 23, 672 deaths have been blamed on Ebola in Liberia, neighboring Guinea and Sierra Leone, according to World Health Organization figures. Liberia accounted for just under one-fifth of those deaths. "This is a major public health emergency. It is fierce, deadly and many of our countrymen are dying and we need to act to stop the spread," Lewis Brown, Liberia's information minister, told Reuters. Referring to the orders issued to the security forces to impose the plan, he added: “We are hoping there will be a level of understanding and that there will not be a need for exceptional force." 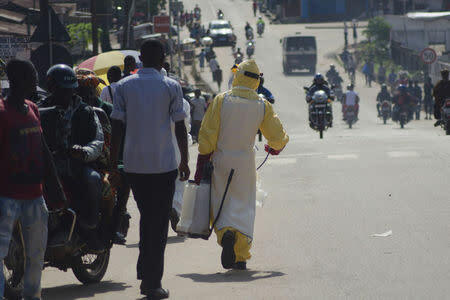 Earlier on Wednesday, Liberian health officials said an isolation unit for Ebola victims in Liberia's capital, Monrovia, was overrun with cases and health workers are being forced to treat up to 20 new patients in their homes. "The staff here are overwhelmed. This is a humanitarian crisis in Liberia," Nyenswah told Reuters by telephone. "People are being given care at their homes until we can move them to the new unit." Initial resistance to building a new isolation unit highlighted the fear and mistrust health workers have faced across West Africa as they battle the outbreak, which has strained the region's weak health systems. Dozens of local health workers have died treating patients and two Americans working for Samaritan's Purse, a U.S. charity operating in Liberia, were infected over the past week. Samaritans Purse said on Wednesday that Kent Brantly, a doctor working for Samaritan's Purse, and Nancy Writebol, a colleague who was also volunteering in Liberia, had shown a slight improvement but were still in serious condition. The organization said that it was withdrawing non-essential staff from the country because of instability and security issues.